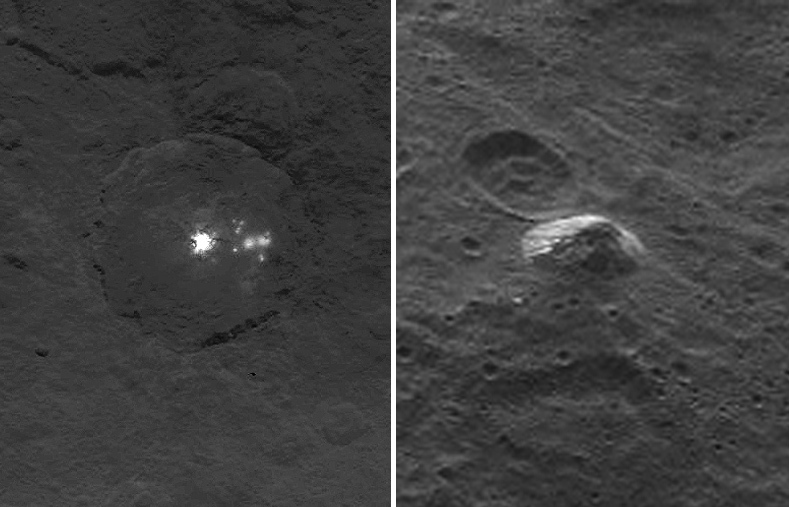 The more NASA’s Dawn spacecraft observes of the dwarf planet Ceres the weirder it seems to get. Closer investigations of the “bright spots” first seen in Hubble images in 2003 and then in Dawn images upon approach during the first few months of 2015 show an ever-increasing cluster of smaller bright areas (eight at last count) and now a strange lone conical mountain has been found, rising 3 miles (5 km) from Ceres’ surface. What are the origins of these features? 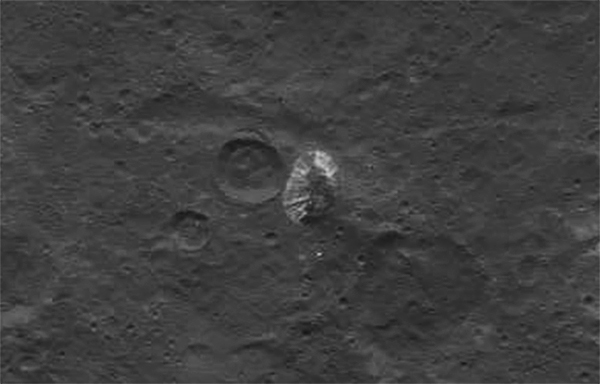 The bright spots are only known at this point to be reflective (rather than light-emitting) substances, and the “great pyramid of Ceres” as it’s being called could be volcanic in origin… but only further investigation will tell. Next Post Are You Ready For Pluto? Looking forward to more information…. Meantime I’m passing along the main point of a discussion with my teenage daughters. They don’t read traditional ‘news’ (despite our encouragement) but get most of their information from Twitter, Facebook and Instagram. When they found out from their father about Dawn and her journey, and the discovery of the Ceres ‘pyramid’ they were very interested and truly impressed, but the discussion soon became “This is a really big deal, why didn’t this get more attention? No-one is talking about it!” (They LOVE the mystery of Ceres’ pyramid mountain.) I know it has been tweeted and offered on Facebook but apparently not in the sphere of what 13-17 year old girls follow. NASA – you’re missing out on a big chunk of your audience and future supporters here because now that they know, my girls are following Dawn’s progress on their own. They’re right – this is a big deal. Sigh. I wish there was a better way to get past their selfies and gossip and engage them directly. The thing is, NASA and the Dawn mission (as well as many others) ARE a big deal on social media. NASA has accounts on Facebook, Twitter, Instagram, etc. that discuss all of these findings, and other news sources DO talk about them too (NBC.com, Discovery News, Universe Today, Planetary Society, SEN space news… Lights in the Dark 🙂 …. you just need to know where to tune in. Lots of folks are talking about it! It’s really a nice and useful piece of info. I am happy that you simply shared this helpful information with us.